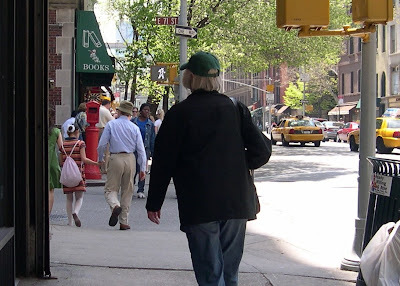 It’s the first perfect spring day in New York and my sister-in-law Agi and I decide to do a major shopping stint—confined to only 4 blocks of Lexington Avenue between 70th and 74th streets. Everyone is outside, and everyone is happy and we are, too—so our first stop is perfect. When we step into Roberta Freymann’s boutique at 153 East 70th we become awash in an Indian pink-orange glow. Roberta Freymann opened her NYC boutique in 2000 to showcase the must-have styles that she creates with artisans from Bangkok to Mumbai. Six years later, she added an outpost in East Hampton (where she spent summers growing up) and also the Roberta Roller Rabbit store [home & fashion] at 1019 Lexington at 73rd. Roberta has perfected the Indian print cotton that we’ve all loved since the 60s/70s. No one does it better. Her collection of fresh, colorful block prints include everything from kurtas, caftans, dresses, scarves, Indian jewelry, and sophisticated embroidered bags to carry it all. Roberta travels abroad six months out of the year but it’s not rare to find her in the store selling away. The Roberta Roller Rabbit [the name comes from a British children’s story] store has mostly textiles for home—yummy quilts and duvets, napkins, tablecloths, pillows, and upholstery textiles that are priced in 5-yard bolts. You can also find tunics, pareos, and block-printed pajamas at this location. Next stop, the perfectly edited Mecox Gardens full of one-of-a-kind antiques, re-editions, art, and contemporary accessories for home & garden. 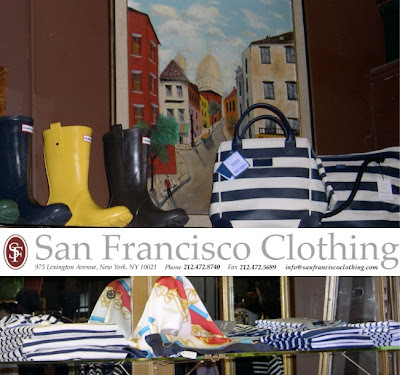 The flagship store opened in Southampton, New York in the spring of 1996, originally as a flower and garden store. 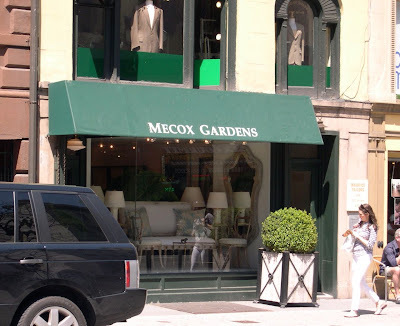 Presently, a Mecox Gardens store can be found in Southampton, East Hampton, Palm Beach, Los Angeles, Chicago, Dallas, Houston [new], and here at 962 Lexington Avenue between 70-71st. Mecox shops are a daily scout-out for decorators because as Dallas store manager Tyler Sweatman says, “it’s a society of instant gratification… you can shop right-off the floor." And, it’s true that you can furnish a house in an entire afternoon from one of the larger Mecox emporiums, right down to home fragrance. 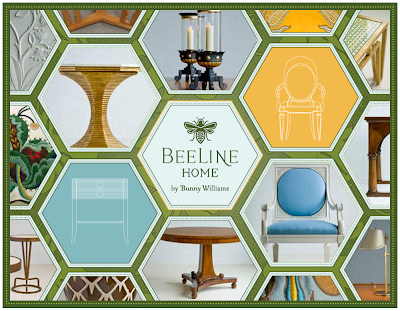 The store will carry everything from Bunny William’s new BeeLine Home collection. Bunny selected Mecox Gardens because she feels that they approach designing spaces in much the same way... "it's all about the mix and the more unexpected, the better." She also "feels inspired every time she walks in the door of a Mecox store." Not in a Mecox-mecca? You can browse a vast collection from all eight locations on the Mecox website [updated daily]. While you’re there, check out The Dogs of Mecox Gardens… you have to love a shop that loves our dogs so much [you can post your pet pix and favorite pet charity to the site]. Mecox's founders have four beloved Golden Retrievers and like us, consider their dogs to be equal members of the family. Five wags of the tail for Mecox Gardens. 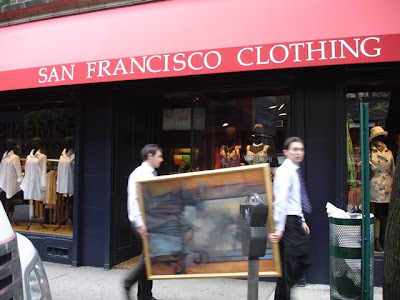 Next stop, San Francisco Clothing at 975 Lexington Avenue. At a time when authenticity is required, this shop has it all. Open for 35 years, the owner named his boutique after a city he loves – a city that shares the shop's aesthetic of originality and quality. And, the selection is divinely original with clothing from Saint James of Normandy [the original French nautical], Hunter and Barbour [original rugged English attire] and authentic Loden coats from Austria. We continue a few doors up Lex and stop to look at the old-world ephemera in the window of York Barber Shop at 981 Lexington Avenue. Established in 1928, this is a first-rate dandy of a barbershop, and reminds us of the New York City that John Cheever once wrote…"was still filled with a river light, when you heard the Benny Goodman quartets from a radio in the corner stationery store, and when almost everybody wore a hat." York Barber Shop is so warm and welcoming that we pop in for a quick break and watch the five full-time cutters in action. York offers haircuts, shaves, barber’s massages, manicures, and men’s facials. The place is full of autographed photos but they are discreet about their famous clientele of actors, politicians, and athletes. Looking for the perfect Don Draper Mad Men haircut? York Barber is your answer. Our next stop is perfect for weary feet. The French Sole flagship store at 985 Lex is the store for the ballet flat lover with over 300 styles from animal cork to quilted patent leather. French Sole combines sophisticated styling with cozy comfort in American, French, and European sizes [let the shop do the conversions for the proper fit]. A shopper’s icon since the 1980s, French Sole is listed in New York Magazine’s Best Stores, and is favored editorially by Vogue, In Style, Elle, and more. The most popular styles are the Sloop and the Passport w/Rubber Sole. When we come out of French Sole and I’m busy taking the store “awning shot” we experience a Woody Allen sighting. He walks right by with Soon-Yi and one of their daughters but my camera is slow to capture the scene – so, here they are from the back. O.K., we are guilty of gawking but on this perfect New York City spring day, seeing Woody Allen is the icing on the cake. Hmmm speaking of cake, we are getting a bit hungry but we venture on to a few more shops before stopping. 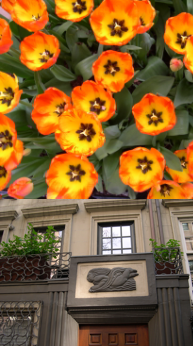 Across the street at 1043A Lexington [between 73rd - 74th Streets] we discover a lovely boutique, Jacqueline Chorney. A Barnard and Columbia Law School grad, Jacqueline [Jackie] is one smart gal and she’s created a tiny but perfect shop. It has a Palm Beach-y vibe combined with sophisticated worldly looks. The store has a stunning collection of 22-karat gold jewelry with semi-precious stones and hand-painted enamel from India. Jackie also designs clothes and her Chinese-influenced 100% silk cigarette pants are extremely popular [shown here on PR contact Julia Huie-Martin]. Pieces range from $50 - $500 and sizes from xs – xl depending on the brand. You will find Sachin & Babi [amazing quality], Sharon Gill, Majestic, Averardo Bessi, Taj by Sabrina Crippa, Avenue Montaigne, of course Jacqueline Chorney, and many more. The store does not have a website just yet but it is open Monday – Saturday [hours 11am-7pm] tel 212-879-1063. A hidden gem... don’t miss it! At last, we decide we need a break and just outside we spot the famous Payard Patisserie & Bistro at 1032 Lex. We love the busy atmosphere with the doors wide-open to welcome all and the lovely springtime air. We meet two handsome actors and laugh a bit then sit down to share a deliciously refreshing blood-orange sorbet. 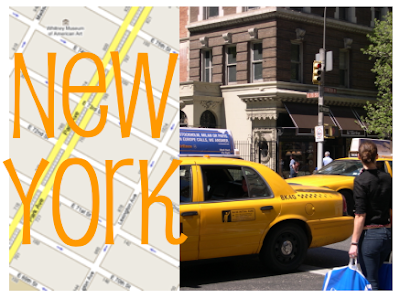 We decide to stroll north one block and then head west on 75th Street over to Park Avenue to hail a taxi. It’s been a long day but we are still feeling happy and inspired by the superb afternoon sunlight shining through the trees as we turn the corner. We gaze at many beautiful New York townhouses as we mosey along. Suddenly we see a beautiful New York couple sitting with their dog on their front steps. We smile and chat and they agree to pose for an afternoon photo. 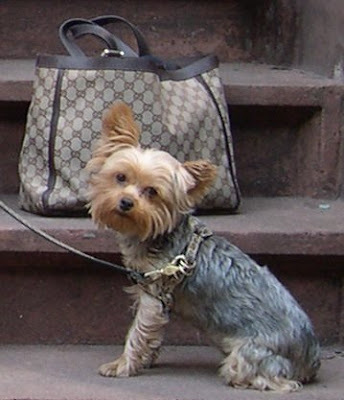 It is here that we end our four block shopping stint on a beautiful street full of beautiful buildings and two beautiful New Yorkers with their delightful little Yorkie. Her name… of course, is Bella. Ah, how I miss New York in the Spring...thanks for allowing me to revisit my memories. 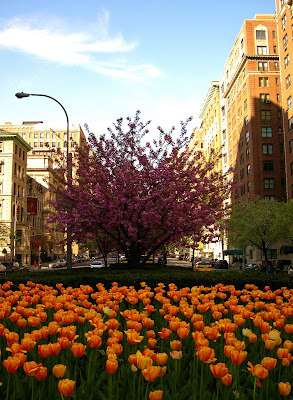 Perfect descriptions of a Spring day in New York as well as the lovely shops that you visited. Some of my favorite shops! Great post. LUV the colorful photo's... and the Woody Allen one is a hoot! What a great day... thanks for sharing it with me too!